Zero Net Energy (ZNE) and Zero Net Carbon (ZNC) are in the news and in our current planning and policy discussion. This makes for an exciting present and near-future for anyone passionate about greener buildings and long-term resiliency while divesting from fossil fuel use. But what do they mean? You’d think such little terms would be eminently understandable, yet they are often complex and sometimes confusing. I have two responses to the complexity – first, let’s strive for clarity, of course. Second, let’s try very hard to not let the detailing of the definitions distract us from the actual work we need to undertake to achieve the vast improvements we seek. Desire for perfection often impedes actual progress. ZNE is most often defined as a building (or project) for which the energy use in a year is less than or equal to the renewable energy produced on-site. The Living Building Challenge energy petal is one approach to certifying ZNE buildings, and below I have posted a link to a list of ZNE buildings from the New Buildings Institute. The California State Energy Code will require ZNE for new construction residential in 2030, and New York state Energy Code is on track to require ZNE buildings in commercial and residential as baseline compliance by 2035. The oft debated element in this definition and effort is the production, via renewable energy, on-site, as this can be tough for many projects especially in urban environments with limited land area. 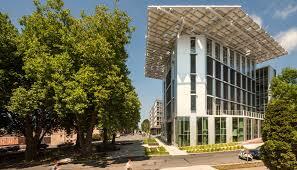 In Seattle, the Bullitt Center managed their design by assessing the maximum production potential with solar panels on a roof, and set that production as their limit for designing the building itself. It is difficult for high-rise projects in cities to produce all their energy use on site at this point in time, due to the limited efficiency of PV and wind turbines, and the intensity of the use of energy in a building of 10+ stories in a small footprint. However, the entire point of this goal is to push efficiencies of RE systems as well as to get design teams to innovate needed efficiencies with and between building envelope, space configurations, user engagement, use of on-site wind, solar, water and soil. I also suggest that aiming for ZNE and missing that goal is an acceptable outcome, because it means we will be doing a whole lot better than otherwise. And, if we “miss” we can certainly subsidize the use of renewable energy by buying into a community solar project. So what is ZNC all about? In brief, this is the next step in understanding and managing our energy burdens, and in reigning in our greenhouse gas (GHG) emissions that contribute to climate change. The debate here is between operational carbon and embodied carbon. Operational carbon is simply the energy used to operate the building, and then doing the math to understand the CO2 equivalence of that energy use. Most forward-thinking policy will require use of source data, which clarifies the way electricity is created in order to understand the emissions profile. The extraction and delivery of heating fuels usually does not reflect a variety of mix data, but may only determine the therms per ton and associated direct emissions. The location of production for electricity, the transmission system and the method of generation are very important. Why? This data, coupled with a desire to reduce GHG, causes us to improve in several ways. What is embodied-carbon? By understanding the extraction, manufacturing, and transport burdens of the materials in the building, we will begin to control the complete life-cycle emissions in our work. I credit Jim D’Aloisio (@greenstructure on twitter) with the concept of “Bloomage”. Bloomage is the envisioned cloud of emissions tied to the creation of the building, in the moment of its construction. To clarify, I will share one example that Jim has used in presentations: the choice of insulation for a retrofit of a home. Most XPS (extruded polystyrene) uses a blowing agent that has a global warming potential (GWP) of 1,400 times the GWP of CO2. The bloomage of this material can easily offset the resulting energy efficiency for 40+ years of the building use. Therefore if the goal is to reduce GHG emissions, that energy efficiency project has created zero improvement for at least 40 years out, and has inadvertently created a market demand increase in emissions in the short-term. Reduction of embodied carbon is not yet an industry goal, although it is one aspect of Life Cycle Assessment (LCA) which I will discuss in a future post. Embodied carbon, however, is incredibly important if we are to truly address CO2 reductions and reduce our ongoing contributions to climate change. All of these measurements and resources can help us to create better buildings and innovate materials and approaches to architecture, engineering, construction, and operations. None of them is a complete end goal all on its own. They are tools for achievement that must support our core goal for a better human experience, aligned with nature’s systems.